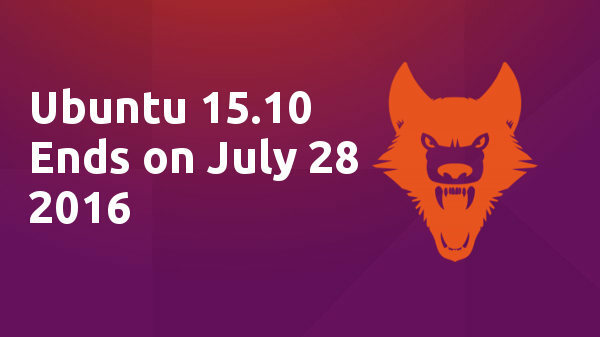 Ubuntu 15.10 Wily Werewolf will reach the end of its life on July 28, 2016. Ubuntu announced its 15.10 (Wily Werewolf) release almost 9 months ago, on October 22, 2015. As a non-LTS release, 15.10 has a 9-month month support cycle and, as such, the support period is now nearing its end and Ubuntu 15.10 will reach end of life on Thursday, July 28th. At that time, Ubuntu Security Notices will no longer include information or updated packages for Ubuntu 15.10. Users of Ubuntu 15.10 can choose upgrade to Ubuntu 16.04 or install Ubuntu 14.04, both Long-Term Support release with 5-year support cycle. how to upgrade to Ubuntu 16.04 LTS (works for final release though the title said for beta). Thats a shame, weirdly 15.10 has been the most stable Ubuntu for me since I switched to Linux two years ago. Not even Ubuntu 14.04 were this stable. In the other hand I want to test the OOB ZFS support in 16.04. But I’m usure if is posible to upgrade from a LTS to the next non-LTS without a clean install. Since I like to be always up to date. Do you recommend me to upgrade to 16.04 or wait patiently for 16.10 in october? It’s able to upgrade from LTS to non-LTS by setting: Software & Updates -> Updates -> Choose “For any new version” as value for Notify me of a new Ubuntu version. You may choose to upgrade to Ubuntu 16.04.1, the first point release scheduled to be released on July 21st. It will be a little more stable.